This page contains semantic queries. It may need to be updated occasionally by using the purge/refresh link above. The first known instance of the (303) 309-0004 number is recorded in a GodLikeProductions forum post by reaperr. This post is not available in archive.org's repository. A (presumed partial) transcript of a recording to the (303) 309-0004 number is posted to the GLP thread by an anonymous user. Raw, the post lists the following.. Converting the alphanumeric codes to their single hex digit equivalents results in..
.. which is ASCII for..
A post is made to 800notes about the (303) 309-0004 number. Again, this post is not available in archive.org's repository. Captain_Jack (aka wprtradio on YouTube) on the GodLikeProductions forum posts a YouTube video to the initial GLP post. The condition code recorded in this call is Blue. Initial threads were posted to /b/ and /x/. The /x/ post (10921476) was archived on chanarchive but it has since been deleted (a backup copy can currently [9/18/2012] be found in Google's cache or here). The /b/ thread (424341309) was archived on pastebin here (or on my site here) and was replaced with a new post (424370830) after a few hours. Message:unk/unk/unk/1 was the message recorded by the OP in the /b/ and /x/ threads. Calls to the (303) 309-0004 number during this day relayed TROOP, AGENT, SUPPLY, and AIRCFT tagged coordinates which were located in North America. Posted to Hacker News and Reddit. The MIGs then dissapeared into Russia and the condition code changed to Red. MELTER3s status blinked on and off from *EMRG*FIRE* (w/ a location of 66.7032 -168.4991) to *NOLOC* (w/ a location of NaN.NaN NaN.NaN). A new SHIP, PETR, is recorded later in the day. Agent code 1337 active. "Gateway One is now active." An untranslated message in an unknown language is recorded in this message. A request for a dead drop was recorded with Agent code 99288. "Gateway Two is now active." The location for this drop was Lake Oswego Public Library in Oregon. The drop is indicating a ISBN number (0-8160-4195-4) and the page in which the drop has been made. Pictures taken during the pickup are available here (on imgur). A suspicious (red shirted) individual listening to sound frequencies and wrtting down notes on his laptop (exact words of IRC user oregon) was observed (and photographed) seated at a table near the drop position. The content of the dead drop was a CD-R. The CD-R ISO can be downloaded at Mediafire. A NATO phonetic message was recorded with Agent code 99286. This message was decoded using p1.txt. Another NATO phonetic message was recorded later in the day with Agent code 2896. This message was decoded using p2.txt. A new NATO phonetic message was recorded with Agent code 99288. This message was again decoded using p2.txt. Normal operation of the (303) 309-0004 number ceases as the number now begins transmitting odd tones. The odd tone, however, has a BPSK31 transmission accompanying it and it is quickly decoded. The message contains a new phone number - (202) 999-3335. For some period of time, the (202) 999-3335 number worked the same as the initial number, but ceased operation later in the day with the same tone as the (303) 309-0004 number, sans BPSK31 message. The (303) 309-0004 also switches to the same BPSK31-less tone. As the numbers shift back to odd tones, this is recorded by mwally's auto dialer. Later in the day, during a small window, the (202) 999-3335 number stopped playing the tone and started playing a new message. <SS5 tones denoting the number> "The number you have reached, 646-0004, is not in service. If you feel you have reached this recording in error, please check the number and try again. Thank you." Analysis of the call window recording yielded a likely hidden message. The general consensus is that the message in the auto dialer message was "There's an alarm in the Vaughnsville DCO", corresponding to the Vaughnsville area number (419) 646-0004 (which is also identified in the previous calls by its SS5 tone sequence). When this number is dialed, the same message as during the (202) 999-3335 call window is played. The (419) 646 NPA-NXX is operated by Vaughnsville Communications which appears to be using a Siemens DCO switch . Later in the day, both the (303) 309-0004 and (202) 999-3335 numbers became active and accepting Agent codes once again. The drop in Blue Hill, ME was retrieved by a librarian at the Blue Hill Library. It was taped under the payphone. The following message was relayed by the librarian..
I’m having a hard time attaching these files due to size limitations on my email. The files on the disc are called data.bin, BCwipe3.exe and truecrypt 5.1a.exe Do you have any other thoughts on how to get you the information you are looking for? Also our little library closes are 2 pm EST and won’t reopen until 10 am on Monday. The contents of the CD-R were uploaded to Google Drive here. The uploaded files were as follows.. Same MD5 as the TC v5.1a available on the TrueCrypt site. Same MD5 as a bcwipe3.exe previously found on the Jetico site. Presumably a TrueCrypt data file. The password for the TrueCrypt data file remains unknown. A T- code has been appended to PAYLD1 in new recordings. The auto dialer recorded a new message with a new message code (99280). The 99280 code contained a new NATO phonetic mesage. Logs of unknown origin were posted to the 11011522 /x/ thread. This user (OTP-Encoder) purports to be associated with the group running the Agent System numbers. The other half to the conversation was posted the next day in the same thread. Later in the day (or actually the next day, UTC), the Agent System began sending a new MSG code to auto dialer messages. This code (99291) had been used the day before with relaying messages in TWC mode.. but now relayed a new NATO phonetic message. This message was decoded using p4.txt'. The pay phone that the second drop was recovered from was run over by a car, which then hit the adjacent clothing store. A local news article (with pictures!) can be found here. Multiple new NATO phonetic messages were recorded via the auto dialer. The tones remained on both numbers the entire day with little known variance. The tones again remained on the entire day on both numbers.. but later in the day, tones on the (303) 309-0004 number changed to a lengthier and varied (with probable encoded data) tone. 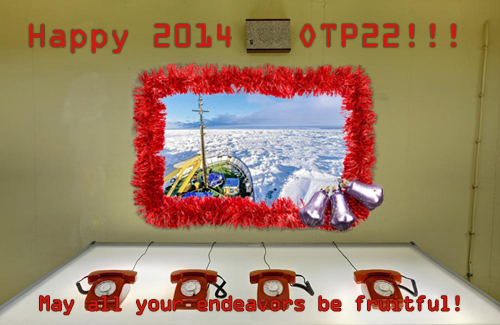 mwally received the CD-R from the otp22:Blue Hill phone booth drop. The current main Freenode IRC channel was changed to #ARG from #otp22. chronomex figured out the 3233 code. [13:19] <chronomex> I got 3233. See Message:09/25/2012/99280/06:18 for a map of the coordinates. Note: This location happens to be nearly exactly in between the previous two drop locations. The significance of this location, however, is not yet known. Superdan recovered a note from the directed Montevideo location. The note contained a phone number.. (709) 700-0122 (raw: 7097000122). The relevant IRC logs from #ARG are below. [21:58] <air_julio> TEXT FROM DAN "Just got back to the cemetary"
[22:03] <air_julio> TEXT FROM DAN : "Nothing inside it. I checked"
[22:20] <air_julio> TEXT FROM DAN "I found something"
[22:23] <air_julio> "A single blue laminated index card. the only thing on it are the numbers 7097000122"
When the (709) 700-0122 number is called, tones play for approximately a minute followed by a error message (per Shidda's call). The auto dialer confirmed the legitimacy of the previous call. Each possible tone combination used in these messages is made up 8 seperate sub-frequencies, each spaced 200Hz apart. One tone combination represents a single byte. The resulting binary data was decoded much the same was as the 3233 code, the binary data is XORed against portions of the data.bin file. The decoded message is as follows..
LOC/ JA14/ ? ? ? The LOC codes in this message are Federal Information Processing System (FIPS) codes. An updated binary tone message from the (709) 700-0122 number was decoded. The decoded message is as follows.. The HK LOC status has shifted to COLLECTED. There is also the addition of a new LOC code, US44. "If you want a call back, leave your name. If you would like assistance, please hang up." IRC user nfx released a web based tool to visually compare the binary tone messages on the (709) 700-0122 number. As of 19:13 UTC, calls to the (202) 999-3335 number result in a new message. The message is as follows..
You have reached the Iridium Satellite Tempe Gateway, your access to the Iridium Global Network. Welcome. Calls to the Iridium test number (Iridium number: +881 6 311 10006) / any Iridium satellite phone can be made via the Tempe, Arizona number 1-(480) 768-2500. Calling the Iridium test number via this line sounds like this. A call to the (202) 999-3335 number was made with the ID spoofed to be 8816 5145 2194 (a 12 digit Iridium number on the NOAA Fleet Telephone Number page). The call was unusually noisy. This gives drop locations in Finland, Rhode Island, Illinois, California, Japan, and Hawaii. The California and Finland drops have been recovered. The Hawaii and Rhode Island locations have been visited without success. Nobody has yet attempted Japan or Illinois. 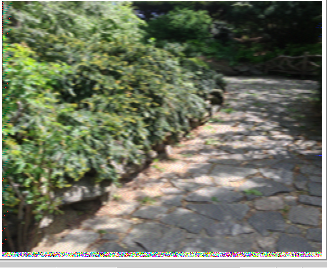 There is now a 25 USD reward for solving the scrambled messages here: /?title=709_700_0122/Investigation#Scrambled_messages, No connection to Message Desk for the last two nights. This has not been standardized to a particular time-zone, yet. UTC would probably be ideal. More data needs to be integrated from #OTP22 logs. Cached 2019-04-20 18:54:11. This page was last modified on September 13, 2013, at 02:14.